On the heels of a trending rumour that Microsoft was to drop the Your Phone Companion App, they decided to launch it on the 8 May 2018. The app’s main purpose is to mirror the content on your Android/iOS straight to a Personal computer. The app gives you the ability to transfer your photos straight from your phone to your window apps. This allows you to quickly continue viewing on your PC whatever you already saw on your phone screen. The beauty of this app is that, it will automatically recognise the make of your phone the moment you plug in, and will also notify you on the amount of charge available on your phone and also charge it. It will also inform you of your phone storage capacity and where you stand in storage at the current moment. This includes both your internal storage as well as your external storage. These simple features have short up the popularity of this app and its 5 million downloads are shooting up the charts in just a couple of months. This is a clear sign that Microsoft has increasingly shifted its focus on improving it Android/iOS based products. You need to link your Android/iOS to your PC in these few easy steps to enjoy it. You shall receive a text message on your phone, be informed that you will be charged SMS fees for this process. By taping on the sent link in your android, you will be taken straight to Google play store. After this app is installed on your Android/iOS, dragging and dropping photos from Android to PC and vice versa will be simplified as well as accessing messages on to your PC as well as Android. 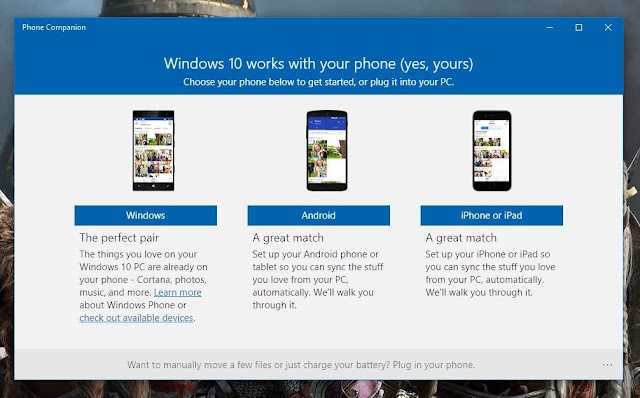 However, according to recent news from WindowsLatest, Microsoft intends to drop Your Phone Companion as a windows 10 feature. This is because they have decided to embed the features into the settings of the next Windows 10 update. This has given life to the rumours that were already in the news even before the launching of the app in May of 2018. Regardless of being a darling for the many people out there, quick fixes and quick recommendations that have been the main promoter of this app will actually be missed. But if you really still believe you need it, keep holding on to the older windows 10 without updates.